Good morning and a cheery Friday to you. What’s with the cryptic subject line you ask? In my years of practicing Veterinary medicine and teaching dog and cat guardians EXACTLY how to utilize my at-home remedies, I am finding something SHOCKING. Drum Roll Please…WHAT is SHOCKING Dr J? That even though many of you are given DETAILED step by step plans as to what to do, many of you are STILL NOT following the steps, and NOT taking ACTION. Many want re-assurance from a ‘professional’… you are still NOT SURE if this will work with your own pet. You want someone else to decide for you. You should be making the ultimate health care decisions for your dog or cat. MOST Veterinarians are STILL giving multivalent vaccines EVERY year – in spite of research documenting the HARMFUL effects of these vaccines. They are doing this even though it is now advised by MOST major Veterinary Schools to NOT give the vaccines so frequently. And what does it all come down to? 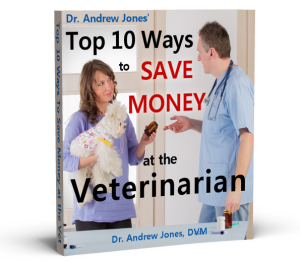 The more often dogs and cats come to a Veterinary practice, the more money the practice makes. Many Veterinarians are on a commission system. They get paid a percentage of the revenue that they generate in a practice. More vaccines – more chances to do additional treatments – mean MORE revenue and more dollars in that Veterinarians’ pocket. Are all Veterinarians profit driven? My at-home pet health exam is simple to use, yet is one of the most important parts of my program. You must systematically examine your pet from her nose to her toes. You must isolate the specific areas of her body that are affected. From there, you then formulate a list of possible diseases. RECORD your findings in an orderly way! This is a summary of your findings from the exam, and it will get you thinking about some of the past history. This gives a big clue to many diseases. I encourage you to use it every time that your pet is ill.
After systematically examining your pet, you may decide that your pet is in need of veterinary care – the well thought out history, along with your observations, are of critical importance. After recording your observations and clinical findings, form a list of disease possibilities. Use the Table of Contents and the Index at the back of the book to read about the specific diseases. In reading about the treatments, decide which is most appropriate for your pet. At that point, read the section that pertains to that type of treatment. If it is Herbal, refer to the section about Herbal Healing for your Pet. If it is Homeopathic, refer to the section about Homeopathic Healing for your Pet. Once you decide upon a course of action, go to a reputable supplier, such as a local Health Co-op, and purchase the specific homeopathic or herbal remedies. While treating your pet, record the daily changes in your pet, including response to treatment, with the Progress Sheets. If your pet responds well to the treatment, great. If they don’t respond, re-consider your diagnosis, or SEE YOUR VETERINARIAN. As I mentioned in the introduction, if you have any concerns about at-home health care for your pet, see your local veterinarian FIRST. They may also back up your tentative diagnosis and offer conventional treatment options. But with your new knowledge you can offer the alternate options and often Heal Your Pet At Home naturally, safely and effectively. P.S. The cost of my digital book is LESS than the price of a SINGLE Veterinary Exam… not to mention treatment. If you get my book, and you DON’T Save more than $47 in 60 day’s I’ll give it ALL back. I often see people buy diet books and read them but never implement the plans they read about in the books. Even if they walk around the workplace telling everyone, that will listen, about the BEST diet plan on the planet they just read about in a book. I think it is the same with your book. We have all the great information but we never implement it. Well, I have implemented some, but I still don’t do weekly exams and fill out the exam charts. Just an idea, and you have probably already considered it, but I think it would be a neat exercise, for us who read your blog and have your book, to try and diagnose problems. You could blog about a problem and we could check your book and use the Comments form to suggest treatment. It might be good practice so when our pet is in real danger and needs help we will have practice giving help.